Bundle up and heat into Central Park. Fireworks start at the Naumburg bandshell, a concert stage located between 66th and 72nd Street. If you want to skip the crowds, head to Brooklyn where the best view of the Prospect Park fireworks are from the Grand Army Plaza. Music, drinks, and great food are, of course, also part of the fun. If you can brave the biting cold win, you can enjoy the best of both worlds on the Brooklyn Bridge. From the iconic landmark, you can see all fireworks across the city. Want to skip the fireworks? Welcome 2018 with the sound of your favorite band. Phis returns to madison Square Garden for another New Year’s Eve run. The tireless jam band has played MSG more than 50 times, making it part of an elite club that includes Billy Joel and Elton John. More than 700 restaurants have New Year’s Eve specials – either earlier in the evening, so that you can make it in time elsewhere for the stroke of midnight, or party-hat-equipped settings that lead up to midnight. At Flora Bar, chef Ignacio Mattos’ uptown seafood stunner in the Met Breuer, two seatings for tasting menus will be offered. The seven-course meal with optional caviar course addition includes frog leg with apple vinegar, sea urchin with burrata, and duck breast with foie gras. For dessert? Layered cake with pear and pecan pie with honey ice cream. For a more casual affair, Momofuku Ssam Bar is serving a four-course chef’s tasting menu for just $88 per person. Add $30 to include a black truffle add-on and a midnight champagne toast. And if you want to stay closer to home, our very own Lexington Brass has you covered with a special menu to ring in the new year. 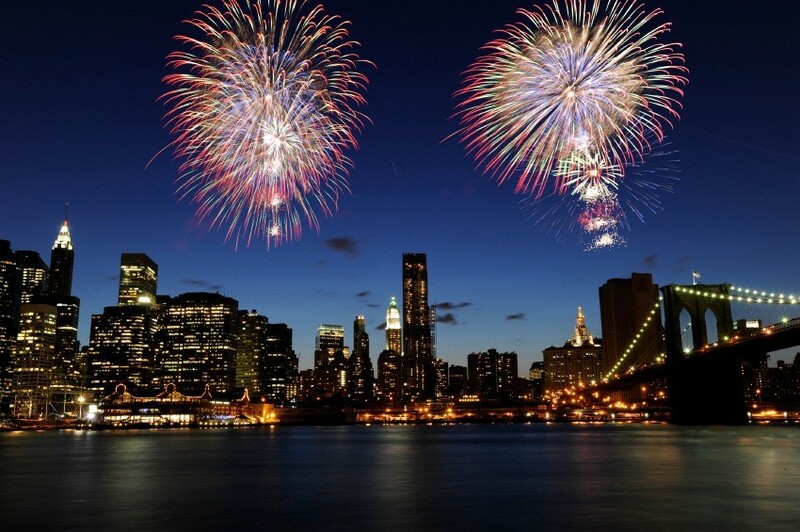 The panoramic views of the Manhattan skyline and New Year’s Eve fireworks beat watching the ball drop. Whether you’re looking for a fancy dinner or just a boat with an open bar, there’s a New Year’s Eve cruise for every type of partier. On the Hornblower Esprit, you can tuck-in to a 6-course dinner and open bar with top-shelf alcohol. For a lower price tag, hop on a New York Water Taxi for open-air views and a cash bar. Don’t wait. Start planning your New Year’s Eve trip today and reserve your stay at Hotel 48LEX to lock in our lowest rate, guaranteed.